Today was a long day of driving - 554 miles and about 480 of that after lunch. We started the day in Colorado Springs and left our hotel around 7:30am heading to Denver. Our Bible Hour was Luke 22 to John 4. We had two stops in Denver to look at, the Denver Mint and Casa Bonita. I had looked into the Denver Mint at the beginning of our planning for the trip but forgot to look again once our dates and itinerary was set. They offer a free tour but you MUST make reservations. I was reminded of this last night in my nightly prep for the next day. They said they do take walk-ups but a limited number. 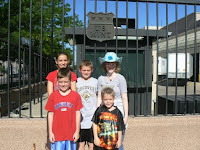 In blind faith or desperate hope, we headed to the Mint in the attempt to get in the 9:00am tour as we had planned. They would add us to the next available tour - at noon! So, we went to the gift shop and took a couple pictures of the outside of the Mint. Way to go Dad in ruining our trip to the Mint! So with a little extra time, we went to Casa Bonita to make sure we were there when they opened. We got there at 9:47am. They open at 11:00am. We wasted some time in the "Everything $1" store and the Family Dollar store in the plaza before heading to the restaurant. Casa Bonita is a Mexican restaurant where the food is only part of the experience. They have a 30-foot waterfall in the restaurant and a cliff diver (see the picture of him doing a handstand dive) who regularly comes out and dives for your entertainment. As well there are gunfights, and escaped gorilla, an arcade, a gift shop, a haunted tunnel and much more to do. We stayed 2 hours! 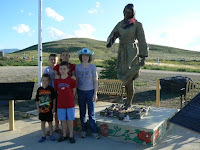 We then got on the road for Wyoming. If you are looking to go to the Grand Tetons or to Yellowstone from Denver, I highly recommend the I-80/287 route through Dubois, WY. The US-287 road is only 1 lane each way but it's 65 the whole way, except for 3 or 4 towns. You feel like you are driving through "Dances with Wolves!" Along the way we saw a sign for Sacajawea's grave and pulled off to find it only about 4 miles from the road. What an unexpected treat! If you are ever in Dubois, WY, the Super 8 motel is very nice and Chandler's Restaurant (next door) is a wonderful local restaurant with great food and a wonderful staff. Well, everyone else is in bed except me. It's 11:01pm local time and we need to be up at 5:30am to begin our trek to Yellowstone. Thanks for reading! Rob and I stayed in Jackson Hole, WY (near the Grand Tetons) and it was gorgeous. We stayed in April though and can you believe they still had snow? It's beautiful out there!